We are incredibly proud of all of all the young people who have participated in the music and arts programs we have supported since 1998. Here are some inspiring musicians and artists we are proud to have supported on their journeys. Thompson Egbo-Egbo has been playing piano since the tender age of six. The Nigerian born pianist began his musical training at the Dixon Hall Music School and has literally grown up with the Minstrel Foundation. A recipient of a full Minstrel Scholarship, he attended and graduated from the Humber College Jazz Performance Program. In 2012 he graduated from the prestigious Berklee College of Music in Boston. This gifted and talented jazz pianist has been impressing audiences in Toronto and the world. Thompson has played for Quincy Jones, Prince Charles, the Duke of Edinburgh, Prince Edward, the Countess of Wessex and Bob Geldof. Thompson directed a 16 week intensive music program "Poetry in Sound and Motion" which was documented in a Hot Docs film "Listen to This". Thompson serves on the Board of Directors of Dixon Hall, teaches at the Regent Park School of Music and has established a Foundation to help children develop and flourish through music. 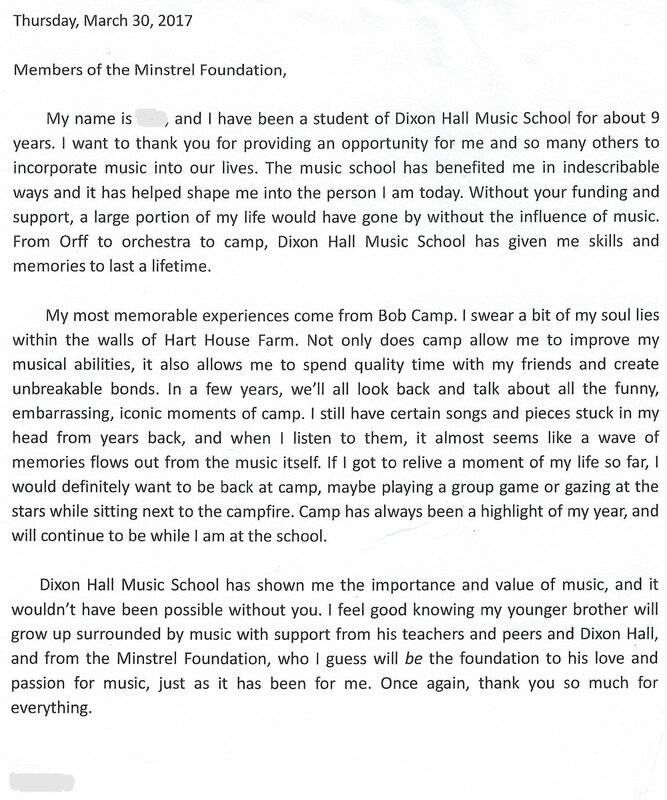 Minstrel Foundation protégé, Eric Tan, won many Minstrel Foundation awards over the years at the Dixon Hall Music School. Eric also won the Royal Conservatory of Music gold medal in theory for receiving the highest marks in Canada in this discipline. Awarded a full scholarship, he graduated in 2015 with a dual degree from Cornell University - a Bachelor of Science, Information Science, Systems, and Technology in the College of Engineering, and a Bachelor of Arts, Music in the College of Arts and Sciences. Eric is currently a Software Developer for the FDM Group in Toronto and is engaged as an IT Consultant at TD Wealth Technology Solutions. Here are photos of Eric on Graduation Day in 2015 and with fellow music students at the Dixon Hall Music School in 2002. Tonia is an accomplished pianist and graduate of the Dixon Hall Music School. Her Minstrel Scholarships enabled her to study under Gloria Saarinen and complete her grade 10 piano and ARCT at the Royal Conservatory of Music. In 2017 she graduated from the University of Waterloo with a degree in software engineering. Her work terms included employment at Google and Microsoft. Upon graduation she accepted a position as a software developer at Top Hat in Toronto, a firm specializing in mobile software applications that has so far raised over $US45 million in venture capital financing. Matthew Brown, Vocalist and Actor, began studying music at the Dixon Hall Music School at the age of 5. He was awarded Minstrel Scholarships for his studies at Dixon Hall, the Randolf Academy for the Performing Arts and the Canadian Film Centre. He turned professional at the age of 16 and has many professional stage credits including the first Canadian production of Jersey Boys, the role of Hud in the musical Hair, the Stratford productions of The Fiddler on the Roof and The Who's TOMMY and the Dora Award Winning productions at the Young Peoples Theatre, Cinderella: A RATical Retelling and I Think I Can. His film credits include CTV's Instant Star, The Kennedy's mini-series and feature films Gridlocked and Odd Squad: The Movie. Currently Matthew is performing in Stratford's Twelfth Night and The School for Scandal. Rees excelled as a bassist in the Humber College Community Jazz Program, thanks in part to a Minstrel Foundation Scholarship. His mastering of music led to the University of Waterloo where he is studying Computational and Applied Mathematics and is in the graduating class of 2019. While at U of W, Rees also holds the position of Machine Learning Engineer at Thalmic Labs. Matt Lagan, Tenor Saxophonist, graduated from Humber College’s Bachelor of Music program 2 years ago and has been active on the Toronto scene since then. He performs regularly at various venues around the city and has recorded and performed with many up and coming musicians. While at Humber, Matt won numerous awards including the 2016 Oscar Peterson Grant for Jazz Performance from the Hnatyshyn Foundation ($10,000).